Just Another Manic Monday. Er, Tuesday. Just ate a mediocre sandwich, but if I had enough patience and kept walking, I could've had a really really delicious sandwich, coffee and doughnut combo from one of my favorite quick-stop eateries, which I forgot was in International Departures. 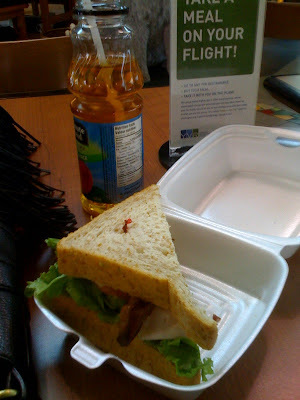 Instead, here's my "Skyclub" from some no-name kiosk.